Children and adults may love the spooky traditions of Halloween, but our pets are less likely to appreciate the costumes, masks, and parties associated with Halloween night. Kit Darling, infection control coordinator at the Texas A&M College of Veterinary Medicine & Biomedical Sciences, recommended a few tips to keep your pet safe this Halloween. Additionally, lollipops and other candies with plastic wrappers can cause intestinal blockage if ingested, Darling said. Be sure to clean up candy trash and store candy on a high shelf to prevent pets from reaching it. Other items to keep away from your pets include candles, pumpkins, pumpkin seeds, corn, lights, and electrical cords. These objects are a hazard if consumed or chewed on by your pet. If you suspect your pet has ingested a dangerous item, Darling recommended contacting the Animal Poison Control Center, at (888) 426-4435, or your veterinarian. Pet owners may want to dress their pet for Halloween night, but this may not be the best idea. Darling said pets shouldn’t be dressed in costume unless you know they are comfortable wearing the outfit. 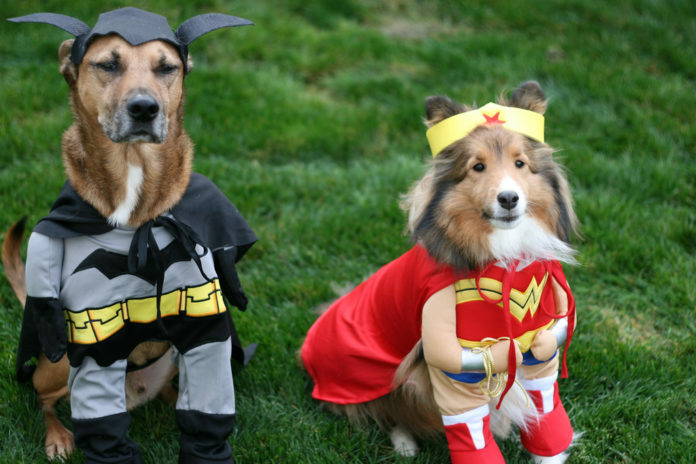 Make sure the costume does not restrict your pet’s movement, hearing, sight, or breathing. Additionally, costumes with lights or batteries are a safety hazard and should be avoided. Keeping pets in a secure location will ensure they are protected from pranksters who may steal, tease, and injure them. Black cats should be kept inside for several days before and after Halloween because they are at risk for being the target of a Halloween prank. Trick-or-treaters or party guests also may startle your pets, which is another good reason to reserve a safe and secure place for your pets to stay on Halloween night. Although pets should have an identification on them at all times, it is especially important on Halloween night. Human and vehicular traffic may frighten animals and cause them to run from the safety of your home. If you are going to take your pet trick-or-treating with you, walk them on a leash and provide them with a reflective collar or tape so they are more visible at night. Darling also recommended a form of identification that could not come off, such as a microchip. Halloween is a fun night for people of all ages, but it is important to keep in mind your pet’s safety when planning parties and participating in other Halloween traditions. Nobody wants to spend Halloween night searching for a lost pet or sitting in the emergency room of a veterinary hospital, so be sure to put your pet’s safety first.